When Alison Martino enters a room, it’s as if someone flipped the switch on a spotlight. Maybe it’s her creative energy, which has been channeled into television, music, writing and interior design. Maybe it’s the shiny blonde locks, sun-kissed skin and boho chic style that give her away as the ultimate native Angeleno. Or maybe she’s just refracting the years of camera flashes and limelight that has shined on the Martino family and inspired her to instinctively preserve what she feels this town is truly about: showbiz. Martino is the creator and curator of “Vintage Los Angeles,” a Facebook community that has amassed a following of nearly 200,000 people. Its fans are all driven to share their memories and experiences of L.A. history while also drinking in the behind-the-scenes stories from Martino’s upbringing. For example, as Halloween approached, she shared a memory of her childhood friendship with Mickey Yablans (who, thanks to being the son of producer Irwin Yablans, had a scene in the film “Halloween” where he runs into Michael Myers), and how she would jokingly play the horror movie’s creepy theme song on the piano whenever he entered the room. Martino’s cascade of stories about Hollywood’s heavy hitters from the 1950’s, ’60’s, and ‘ 70’s comes from being the daughter of powerhouse crooner Al Martino, who rose to fame with the ballad “Here in My Heart” in 1952 and secured his iconic status among Italian-American singers with his 1967 hit “Spanish Eyes.” He parlayed his musical success into an opportunity to act in the Godfather films as singer Johnny Fontaine. Originally from Philadelphia, Alison’s father remained based on the East Coast during the early days of his career, but while flying around the country promoting his records in 1963 he met a striking American Airlines stewardess. Her name was Judi, and she was a model for the airline’s promotional photographs. The singer knew the moment he met her that he would marry her. After four years of trying, Judi decided to give him a chance, and they were together until the famed musician’s death in 2009. The couple moved to California in 1968, were married the following year, and in December of 1970 they welcomed their only child, a little girl whose name pays tribute to her devoted dad. Martino says her days of collecting vintage memorabilia essentially began on her first day of life, when she was born at the former Cedars of Lebanon Hospital on Fountain Avenue just west of Vermont Avenue (now the headquarters of the Church of Scientology). The hospital was in the process of changing its name to Cedars-Sinai Medical Center, and the small white button given to Judi Martino that read “Congratulations, it’s a girl!” in pink lettering was among the first items imprinted with the hospital’s then-new name. Martino lives in one of West Hollywood’s best known buildings, Empire West, which Suzanne Pleshette, star of Alfred Hitchcock’s “The Birds,” once lived in and managed. It was built in 1964 by famed L.A. architect Dan Dworsky, whom Martino tracked down after moving into the building in late summer. She brought Dworsky back to his building for the first time in 50 years, and she learned what about her apartment was original or altered. Martino makes finding proverbial needles in Hollywood haystacks look easy, but then she’s been doing it since her days with the E! Television network in the 1990’s. The entryway of her apartment gives testament to her research skill. The wall is covered in classic and rare photos of Martino’s icons. There are many photos of the Doors, for whom she ran a fan club when she was 19, including several shots by Henry Diltz that allow Martino to fancy her wall as a personal extension of Diltz’s esteemed Morrison Hotel Gallery inside the nearby Sunset Marquis hotel. In Martino’s office, every available surface is adorned with photographs and memorabilia. Photos of her father seated at a table with Marilyn Monroe and swing dancing with Nancy Sinatra are on the same wall as his gold record for “Spanish Eyes.” There’s also an old color photo of Martino around age four lovingly gazing up at her dad, who is smiling at the camera. That photo ended up on the back of her father’s 1975 album “Door of the Sun,” and the framed image on the wall was a gift from Capitol Records. Mixed with the books on her Beatles memorabilia-laden shelves — each piece collected from her childhood — is Vincent Bugliosi’s classic about Charlie Manson, “Helter Skelter.” Portions of that book were written while Bugliosi was living in the Martino family’s guesthouse at the Beverly Hills home where her mother Judi still lives today. Academy Award-winner Mario Puzo, who wrote “The Godfather” novel and was a screenwriter on the film, also lived in the guesthouse for a time during Martino’s childhood. When she was growing up, Martino’s favorite people around the house were the men her father considered brothers: comedian Morey Amsterdam and entertainer Joey Bishop, who would eventually join the Rat Pack. She recalls the antics her father and Amsterdam put on to make Bishop laugh and how her father happily revived his earliest job as a bricklayer to construct Bishop’s driveway around the corner from the Martino house. Martino’s childhood also featured some of the most famous establishments to ever grace the streets of L.A. and the Sunset Strip. One was Dino’s Lodge, which was opened by Dean Martin in 1958 only to become a tourist trap after being featured in the show “77 Sunset Strip.” After it closed, it was turned into office space and ultimately demolished in 2013. But its place in music history and L.A.-based television history earned it a special place in Martino’s heart. Martino has a collection of small items from that celebrity hotspot of the early 1960’s. Ever since childhood, it was small mementos like those from Dino’s Lodge that drew Martino’s attention. She felt compelled to grab a matchbook from every place she visited. She also developed a taste for branded ashtrays that led to an impressive collection on display in her apartment. Beginning in kindergarten, Martino had a best friend who moderated Martino’s desire for tokens such as the tiki glasses from Trader Vic’s at the Beverly Hilton hotel. Laura Fleming (now Laura Fleming-Hizami) lived near Martino in Beverly Hills, and the two were inseparable from early childhood through their late teens. Fleming-Hizami remembers the hours she and Martino spent in cherished haunts that no longer exist, including Postermat in Westwood where the girls would buy movie and music posters, the unforgettable Tower Records store on Sunset Boulevard, and Flipper’s Roller Boogie Palace, a roller rink that opened in 1979 at the corner of Santa Monica Boulevard and La Cienega Boulevard in the heart of West Hollywood. Fleming-Hizami said Martino has always had a knack for knowing “what would be popular before it became popular.” She shopped at vintage boutiques in Beverly Hills before any other teens thought to look through used clothes for fashion gold. In 1995, when Chasen’s closed after 59 years, Martino thought it would be cool to have the maitre d’ sign one of the paper menus printed up for its last supper. After she snagged the autograph, the other guests quickly caught on and all rushed the maitre d’ with their own menus to secure a piece of Hollywood history, Martino style. Pop culture commentator and historian Charles Phoenix, a friend of Martino’s for several years, thinks Martino’s sense for the next big thing led her to choose social media as her platform for a public tribute to bygone L.A.
Martino’s collecting goes beyond old Hollywood memorabilia. 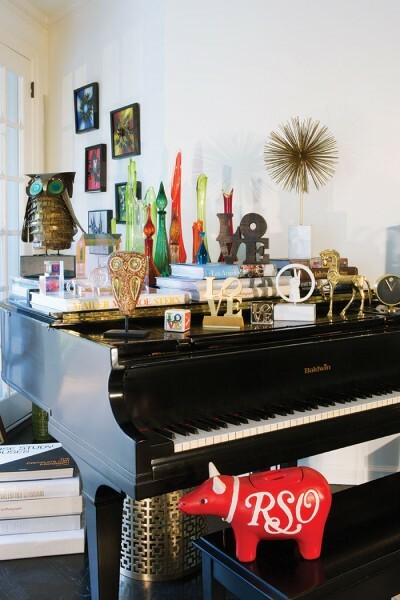 There are signs of her favorite things throughout her home, all meticulously organized. Her walk-in closet is home to more hats, vests and sunglasses than are likely in stock at a local boutique. Randomly scattered renderings of Robert Indiana’s LOVE sculpture dot the house, an homage to Al Martino’s hometown of Philadelphia as much as to pop art itself. There is a personal story behind each piece. The black grand piano in the open space between her living room and kitchen was once brown and labeled on the side with “ABC” when it was used on the Joey Bishop show. When Bishop gave the piano to his buddy Al Martino, Al decided to paint it black, much to his daughter’s dismay. On a nearby wall is a framed cutout portrait from Disneyland, a souvenir one can still get today. But today’s cutouts are done with computers, whereas the one hanging on Martino’s wall is of her as a toddler, and was hand cut at the amusement park in the early 1970s. The showcased memorabilia is complemented by the apartment’s mid-century modern style — inspired by the Peter Sellers film The Party — that is part of Martino’s passion for interior decorating. A scalloped wallpaper design by David Hicks in the guest bath is just a few strides away from a 1972 lucite table and chairs by Charles Hollis. There are choice pieces by Martino’s favorite furniture designer, Jonathan Adler, including a pair of Tiffany blue chairs adorned with criss-crossing gold support beams, whose square shape and simple legs give a 1960’s mod vibe. Martino has amassed so much physical L.A. history that it can’t all be displayed at once. There is a closet entirely devoted exclusively to collected and vintage items, as tidy and organized as her walk-in, so that Martino can easily find anything in the mass of postcards, matchbooks, ticket stubs and hundreds of ashtrays from restaurants that no longer exist. 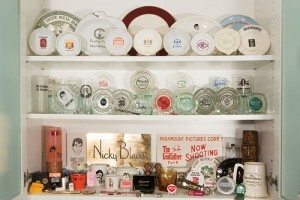 Behind the frosted glass doors of another cabinet is a meticulously displayed collection of lighters, ashtrays, cups and buttons alongside such unique tokens as a candle from Dino’s Lodge and a NOW SHOOTING sign from the set of Godfather II. “I’ve never seen someone become more joyful over a pack of matches from a once-great lounge!” said Tina Malave, senior producer of ABC 7’s “Eye on L.A.” and Martino’s friend of 15 years. Malave highlighted the online community created through the Vintage Los Angeles Facebook page, as well as its significance in connecting the L.A. of then and now, on a segment for “Eye on L.A.” in 2014. Martino’s posts of factoids and photos and stories to Vintage LA’s Facebook page as well as Twitter and Instagram has created a resource that has been called “The DeLorean of the Internet,” a reference to Back to the Future’s time-traveling car. But she works just as hard to keep Hollywood history alive in the offline world. She hosts screenings of old films and shows that include visits from the filmmakers at the Million Dollar Theater downtown or at the Hammer Museum, where she showed several episodes of the 1964 series “Ralph Story’s Los Angeles” on Nov. 14 in conjunction with UCLA. Martino also advocates for landmark status for vintage locales like Dan Tana’s and the Troubadour. This summer she worked alongside the Los Angeles Conservancy to successfully get the Norm’s diner on La Cienega Boulevard — a unique Googie-style building that has stood there since 1957 —declared a cultural-historical landmark by the City of Los Angeles. On top of all this, she’s begun the process of creating her first Vintage Los Angeles book. Martino already has had several preservation victories. When a Rocky and Bullwinkle statue that had stood on the Sunset Strip near the Chateau Marmont from 1961 to 2013 was unceremoniously hoisted from its place by a crane so DreamWorks Studios could repair a crack on it, Martino drummed up concern for the sudden disappearance of the statue through a Los Angeles Magazine article and Vintage Los Angeles. DreamWorks donated the statue back to the City of West Hollywood in August so it could be reinstalled on Sunset Boulevard. In late 2014, Martino went on what she calls “a crusade” to save the 2,300 caricatures of famous entertainers that adorned the walls of The Palm restaurant in West Hollywood. Several of the rescued characters are stacked in her office as she continues to try to track down people connected to each of them so she can return these irreplaceable pieces of history. As for her father’s character, she plans to frame it alongside that of his soul brother, Morey Amsterdam. 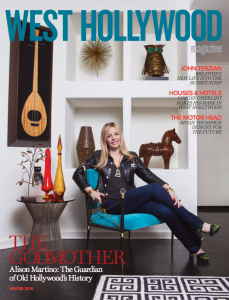 EDITOR’s NOTE: This profile is the cover story in the recently released Winter issue of West Hollywood Magazine. To find a copy at a newsstand or shop go here. To order a copy, go here. Great article indeed! So glad I got “turned on” to it, as well as her work w/Vintage L.A! Can imagine all the stories she must have to tell. Would probably keep her friends in awe for hours on end. Keep up the inspiring work and thanks so much for re-introducing this interesting gem! NOBODY has the passion, the resources, the knowledge and the tireless devotion to celebrating and honoring and preserving this city’s glorious (and sadly imperiled) culture and history like Alison Martino! Her ‘Vintage Los Angeles’ page – nearly 275,000 strong – continues to be my favorite facebook page, for its articles, links, pictures and resources. THANK you, WEHOville for this GREAT article, and may it help keep this city’s epic history strong and vibrant!